Strains Of Silence by Bethany Kaczmarek is a contemporary Christian novel that tackles the subject of domestic abuse. 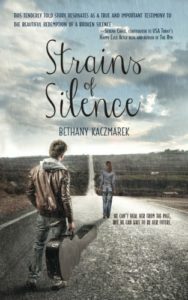 It is a gritty read and while there are no explicit scenes, Bethany Kaczmarek does not shy away from the damage and impact on lives. Domestic abuse may be verbal or physical. It may start small and escalate or it may start big. It is never the victims fault and it is always wrong. The pain is huge affecting every area of life – waking or sleeping- and all members of the family. The novel shows the support given by both family and friends, who show unconditional love and offer protection. Victims feel guilty. Or angry. Or worthless. They need help – both professional and personal to heal. And they need to know God. God who stands by us, who weeps when we weep, who hurts when we hurt and who whispers “beloved”, “my child”, and “beautiful” over us. We need to know who we are and whose we are. We need to listen to God’s voice and drown out all the competing voices. In spite of our past, God can still use us. Our experience will ultimately strengthen us and will enable us to walk alongside others in a similar position, offering love and support. Strains Of Silence was a powerful read and grounded in God. It was a distressing read at times but we must not shy away from worldly issues. Thank you Bethany Kaczmarek for highlighting an area that is not often talked or written about. Wow! Thank you, Julia. I’m glad you saw the heart of my book.